The city of Kawagoe retains much of the charm of the Edo period when it grew to be a prosperous and esteemed merchant town. Edo was the historic name for Tokyo when the Tokugawa shogunate established it as the capital of Japan. 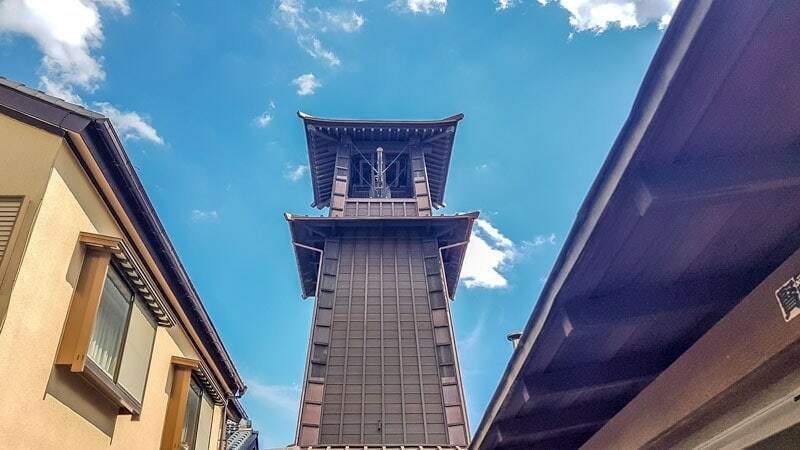 Today Kawagoe is known locally as Koedo, or Little Edo and as you explore the city you can feel almost like you’ve stepped back in time to another era. These are our picks for the top things to do in Kawagoe. As we’ve discussed before in our articles on day trips from Tokyo, we love the big city but find we need to take short breaks from the intensity and crowds. 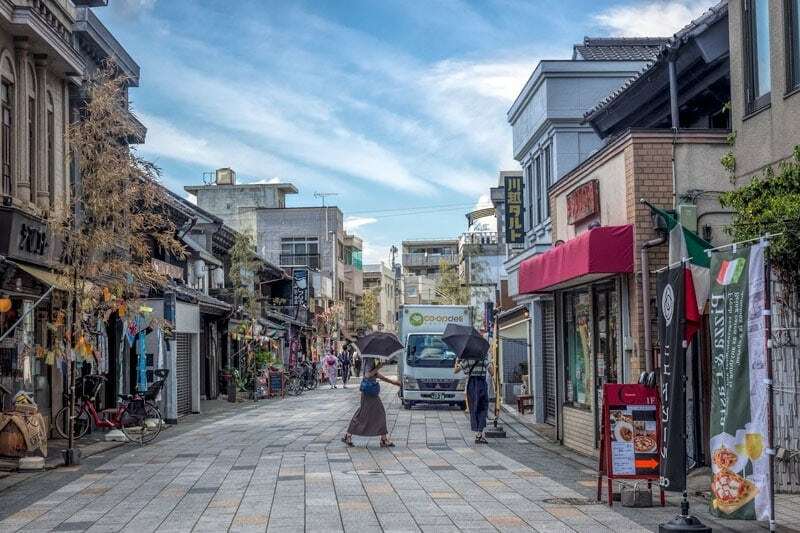 Kawagoe is a a great side trip, it’s a very short distance to travel, there’s plenty to see and do, and it provides a real contrast to the modern city of Tokyo. Kawagoe is an easy 30 minute train ride from Ikebukuro station in Tokyo on the Tobu Railway line. A standard return ticket will cost Y 940 but for international tourists there’s a choice of 2 passes depending on whether you want to also use the buses in Kawagoe for getting around. The Kawagoe Discount Pass is Y 750 and includes the return train trip from Ikebukuro plus discount vouchers to use in both Kawagoe and Ikebukuro. The Kawagoe Discount Pass Premium is Y 950 and includes the return train trip, discount vouchers plus use of buses within central Kawagoe. The Tobu Koedo Loop Bus starts from the Kawagoe train station and stops at, or near, most of the major attractions. 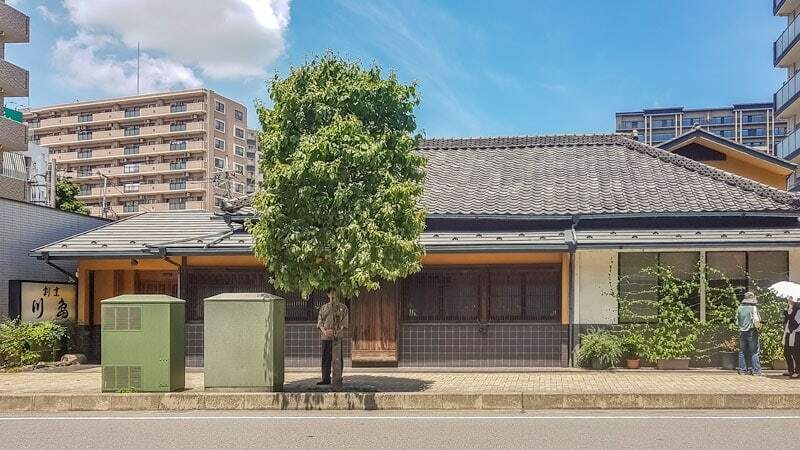 Many visitors will explore Kawagoe on foot, most of the attractions are in a compact area and this will be practical for many people, it’s how we’d normally cover an area this size. Pick up a walking map from the visitors centre or use Google Maps on your phone if you have a mobile wifi connection in Japan. If you want to get quickly between two points there are taxi’s available. For the short distances around town the price is comparable to what you’d expect to pay in Australia for inner city trips. If you want to reduce the amount of walking and get to a number of different points of interest another option is to use the unlimited Kawagoe Co-Edo Loop bus ticket. It can be purchased at a discount as part of the Kawagoe premium pass mentioned above. If you haven’t purchased the pass and decide later you want to take the bus back to the station you can either pay cash on the bus or touch on and off with an IC card such as SUICA or PASMO. You’ll begin to feel the history of Kawagoe as you walk the streets of Kura no Machi. In Japanese Kura are warehouses and Kurazukuri refer to the clay clad warehouse structures that were used in Kawagoe and still seen in the old town today. Trade with Tokyo in the Edo period made Kawagoe merchants quite wealthy and enabled many to them to not only build their warehouses in this style but also their stores and homes. This is something you don’t usually see in other towns. Despite this more fire resistant style the Great Kawagoe Fire of 1893, shortly after the end of the Edo period, destroyed many of the buildings but they were subsequently rebuilt in the same style to preserve the history and character of the town. Watch out for Osawa House as you wander down the main street of the old town. This is the only original building that remains from the Edo period and was the inspiration for rebuilding the area after the fire. It belonged to a wealthy kimono merchant and was constructed in 1792. Today the ground floor has local handcraft for sale. Many of the warehouses down the main street have been converted into small shops and cafes. Take your time to wander in and out, browse the items for sale and stop for a while for a refreshing drink and to take in the ambiance. 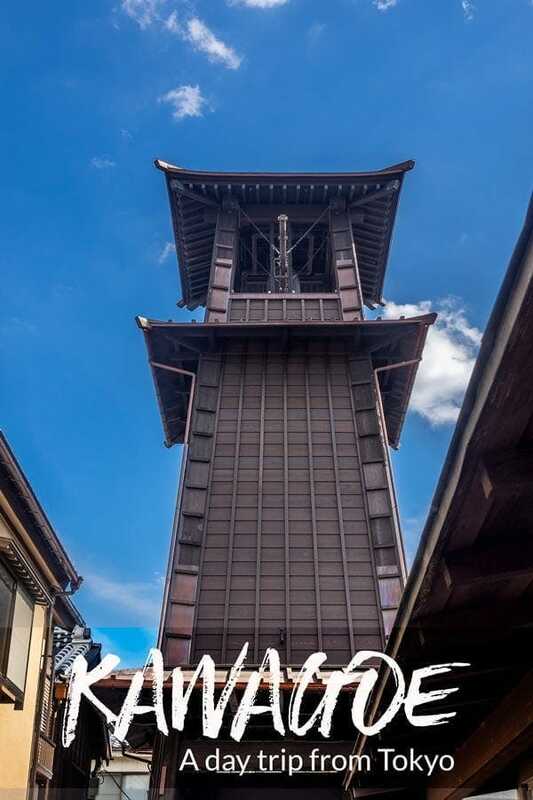 The bell tower is the distinctive symbol of Kawagoe. It has rung out across the town announcing the time since early in the Edo period although the current tower was rebuilt immediately after the Great Fire in 1893. It’s located in the warehouse district and still sounds 4 times a day. At the top you will notice a large bell and striker similar to what you’ll see in temples across Japan. The difference here is that the large pole strikes the bell automatically at the scheduled times. 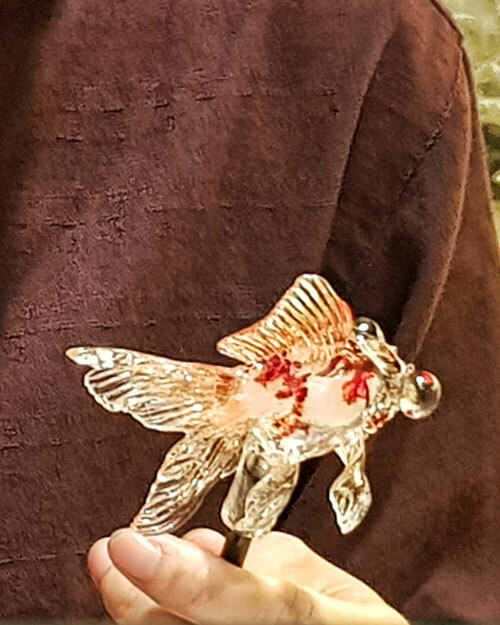 Many of the vintage candy stores in Penny Candy Lane are only open on the weekend and that’s when you’ll want to be here to see the artisans at work creating hard candy figures. I’ll include a couple of photos here of two artists at work forming the taffy like candy into a figurine and then hand painting it. These were taken at the Solamachi shopping centre next to Tokyo Skytree as I didn’t get the chance to photograph it in Kawagoe. Kita-in is an important ancient temple complex dating back to 830. There are a few unique and interest aspects to look out for on a visit here. The temple is now home to the only remaining buildings from Edo Castle. In 1638 the majority of the temple complex was destroyed by fire. Kawagoe and the temple was so important to the ruling Tokugawa Shogunate that several palace buildings were ordered to be dismantled and moved from Tokyo to the temple grounds and reassembled. Years later the Edo palace buildings in Tokyo were themselves destroyed by fire meaning these are the only examples remaining from the period. The part I was most looking forward to seeing were the Go-hyaku Rakan, a collection of 500+ stone statues of Shakyamuni Buddhas disciples. These are in a separate courtyard with an entrance fee. 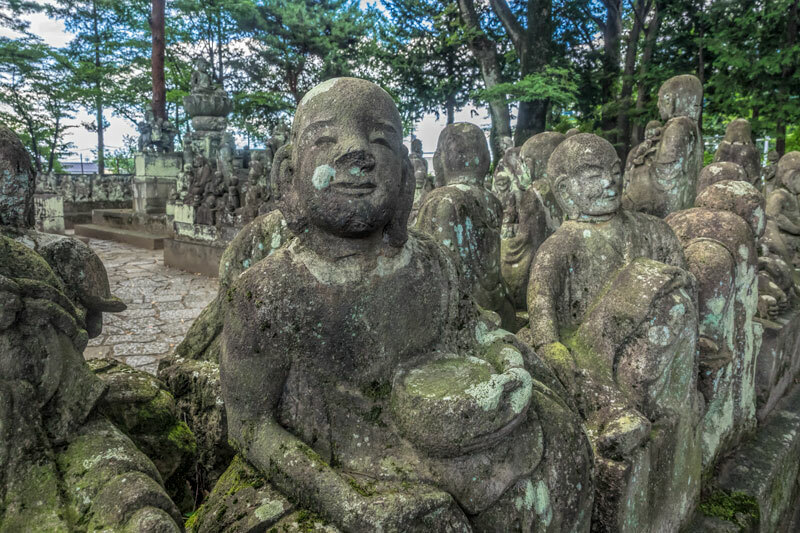 The stone statues were individually carved between 1782 and 1825 and each have unique features and personalities depicted. What makes these Rakan different to others you may have seen is that many have humorous expression or cheeky antics like whispering to one another. You will also see the various animals of the Chinese zodiac incorporated among them, I found the monkey, can you find yours? There are many places in Japan to rent a kimono or yakata. 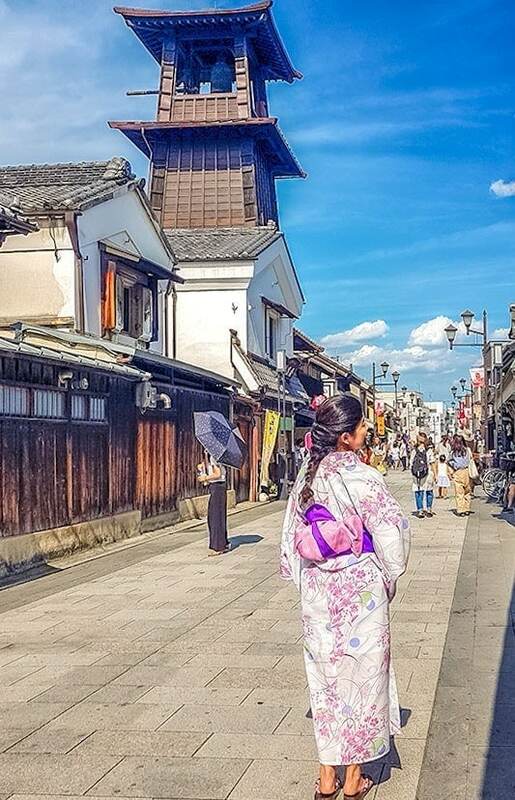 Exploring historic sites or a historic town such as Kawagoe in the traditional dress is very popular for both men and women. Many young women wear yakata during the summer time to attend shrines and festivals that are held throughout the country. 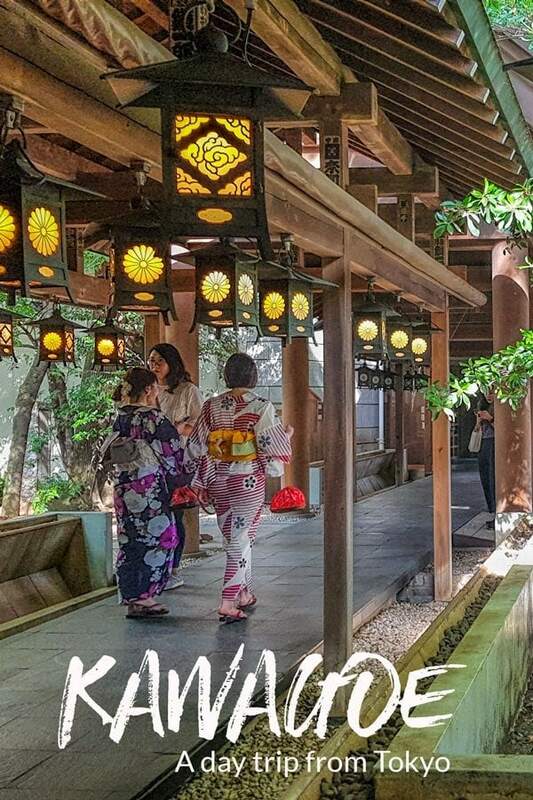 We were in Kawagoe a couple of days after the Star Festival known as Tanabata and during the wind chimes festival at Hikawa Shrine, both popular events for young women to don the traditional dress. The rental studios provide all the required components and will help you dress in them correctly, some even include hair styling and assessories. Hikawa is a shrine for the romantics at heart and it takes around 10 minute to walk here from the street of heritage stone warehouses. 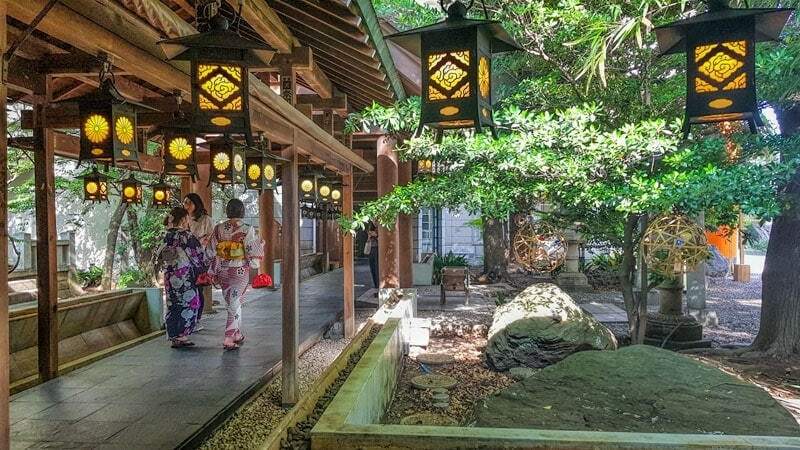 With a 1500 year history of success in matchmaking and matrimonial happiness young women will dress up in their best yakata and travel here to make their wish of finding a husband known to the shrines deities. 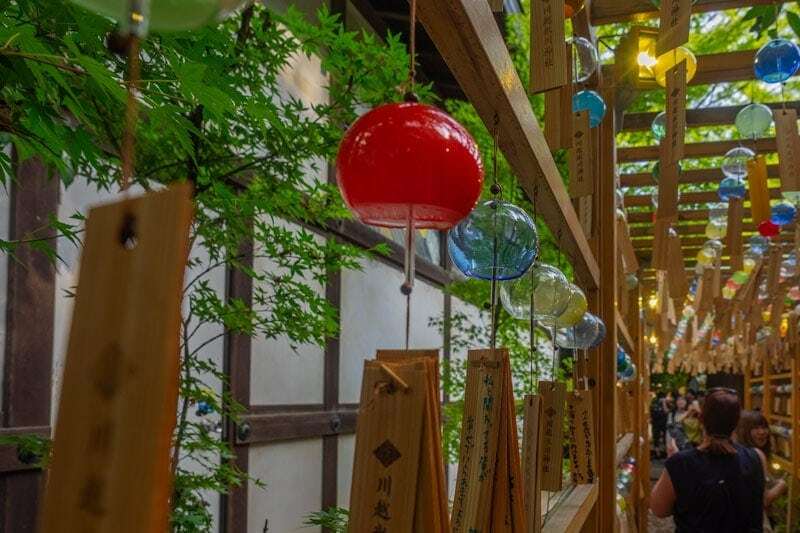 In addition to praying at the shrine, they can also purchase a lucky charm, a fortune in the form of a tai (snapper fish), walk around the blessing tree, through the tunnel of ema and during the Enmusubi Furin festival beneath the wind chimes. To be honest I was walking beneath the chimes too but it was for the cooling water mist that was being sprayed on one of the hottest days of the year so far. We were visiting during summer and from early July until early September there’s a festival here known as the Enmusubi Furin. Furin are wind chimes and are often associated as a sound of summer in Japan. 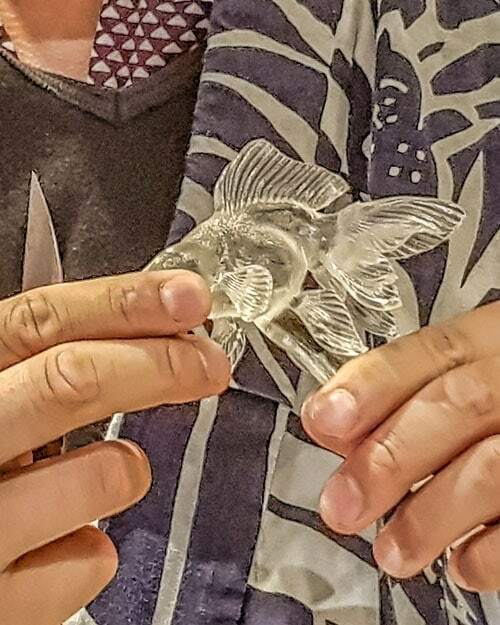 They consist of a glass bowl, some sort of small weight that’s positioned to strike the bowl making a sound when the chime moves and a piece of paper or light wooden tablet that hangs below that. They make a surprisingly pleasant and delicate sound when they ring out in the breeze. 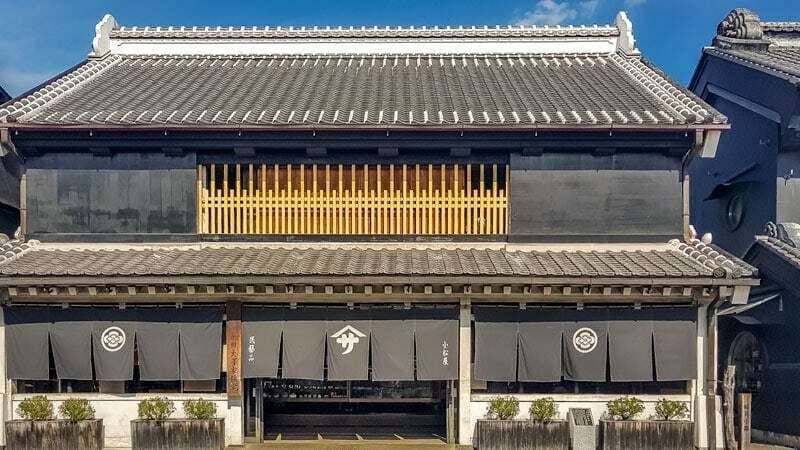 A ryotei is a traditional Japanese restaurant from the Edo period (1600 – 1867) making it the perfect addition to your day trip to the historic merchant town Kawagoe. Originally ryotei looked after the Shogunate officials who traveled to the town or high ranking bureaucrats and businessmen. Today ryotei continue to be high class restaurants and you should make a booking to visit but many no longer require a members recommendation and welcome foreign visitors who want to experience their delicious cuisine and atmosphere. We ate at Kawashima which is about 1.2 km from Kawagoe station, a 10-15 minute walk. The historic house was converted to a restaurant with a beautiful garden that can be viewed from inside and several private dining rooms of various sizes. 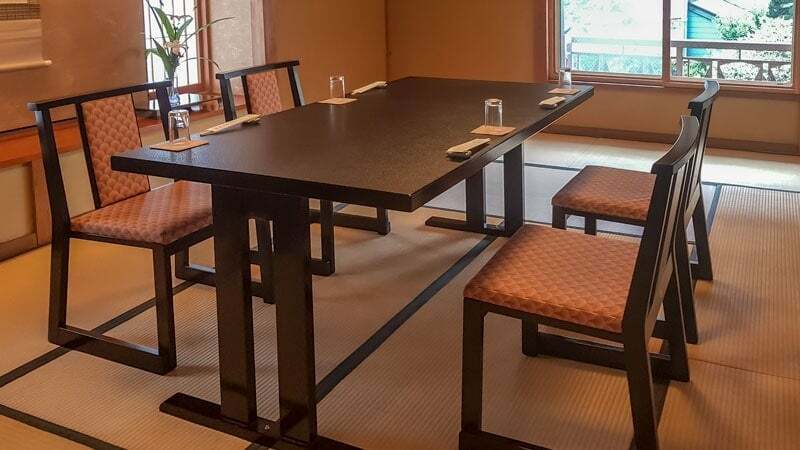 The rooms are traditionally decorated with tatami mats and exquisite minimalist decor so you take your shoes off as you enter the house but our room had a western style table which can be more comfortable for an extended meal if you aren’t used to sitting on the floor. 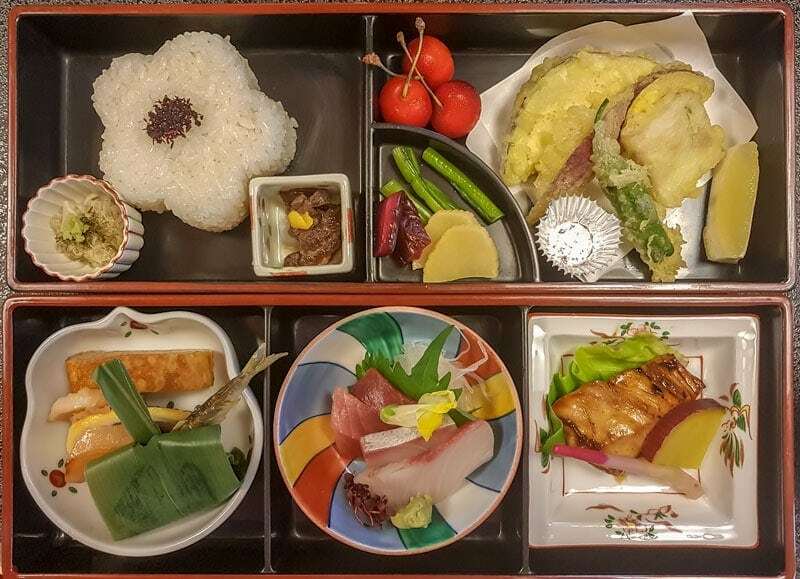 The meal itself blends the freshest seasonal produce, traditional techniques for preparation and art. If you believe as we do that you eat first with your eyes, a meal like this will be a real treat. Phone bookings on 049-224-3456, your hotel concierge will be able to do this for you. We often recommend making side trips from Japans larger cities during the week when most locals are at work to minimise the crowds. With Kawagoe we suggest the opposite. It’s a fairly quiet town during the week and some of the attractions will not be open meaning you won’t get the full experience. If you want to see the artisans at work in Candy lane for example they’re only there on the weekend and several of the stores are closed at other times. In the temples too some sections are only open on weekends and holidays. 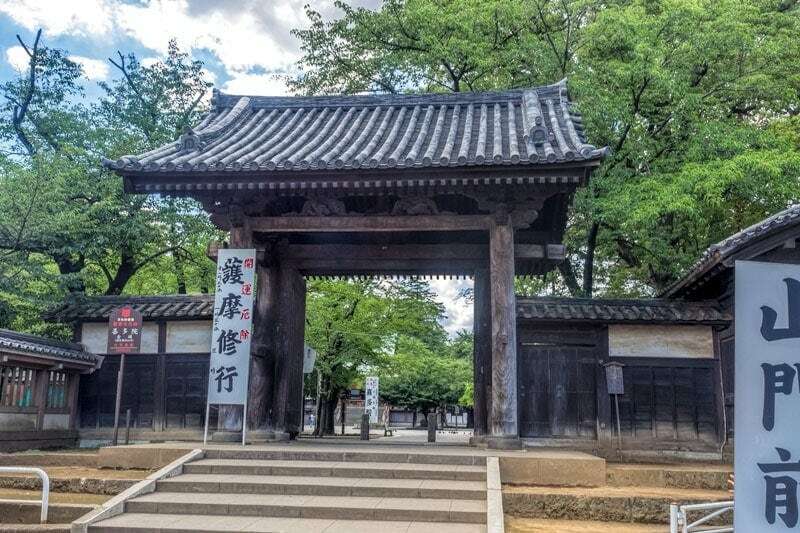 Overall we’d recommend Kawagoe as an interesting day trip from Tokyo and the short 30 minute train ride makes it quicker to get to this part of Saitama prefecture than some parts of Tokyo itself. Hi Toni! THank you so much for this article. I’ve been looking for a good day trip near Tokyo and this is just perfect. Safe travels! Thanks Pauline, have a great trip! Konnichiwa! Where do you buy the Kawagoe pass from? Ikkebukuro station? Hi Jasmine, yes there’s a Tobu Railways kiosk at Ikebukuro station and we got them there just before going through the gate. Oh how exciting, now only 9 days, have a fabulous trip! I wish i would have known this before going to Japan. What a cute town. Thanks!